NB: depending on the vehicle, screen 1 shows the vehicle surroundings alongside the beeps. 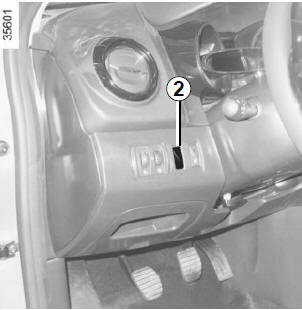 When reverse gear is selected, most objects which are less than approximately 1.20 metres from the rear of the vehicle are detected, a beep sounds and, depending on the vehicle, display 1 lights up. Depending on the vehicle, certain settings can be adjusted from the touchscreen 1. Please see the equipment instructions for further information. Press switch 2 to deactivate the system. 5 seconds. Please contact an authorised dealer.